The future of renewable energy – wind energy – in Croatia, just as in the whole world, is guaranteed by the needs of the states for sustainable development, environmental protection and energy efficiency. Taking advantage of the wind through the windmill is one of the popular ways of exploiting the earth energy, which through the wind and its kinetic energy, with the help of turbines, turns into electricity and thus represents another alternative and renewable source of energy. Wind is in fact an indirect form of solar energy because the wind appears because of differences in temperatures between the warmer parts of the earth (Equator) and the colder parts (Poles). Temperature difference creates a difference in the pressures that causes the moving of the air masses. Warm air heated around the Equator rises in height until about 10 km and travels towards the poles. When the earth would not rotate warm air would simply come to the poles, become colder, sunk and went back toward the Equator. Since the earth rotates on the wind affects the Coriolis effect, too. Of course, the microclimate has its impact, particularly in the areas along the coast. 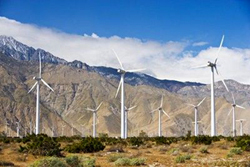 The production of electricity from wind energy increases its capacity for 19 to 20 percent annually, which can be compared with the areas for which a strong growth is characteristic, such as the internet or mobile communications. In the today’s modern world the energy from renewable sources occupies a special place, because it brings the promise to realise the goals of sustainable development. New technologies allow us taking advantage of new, renewable energy sources for the electricity production and thus the shift away from present forms of dependence on fossil fuels.